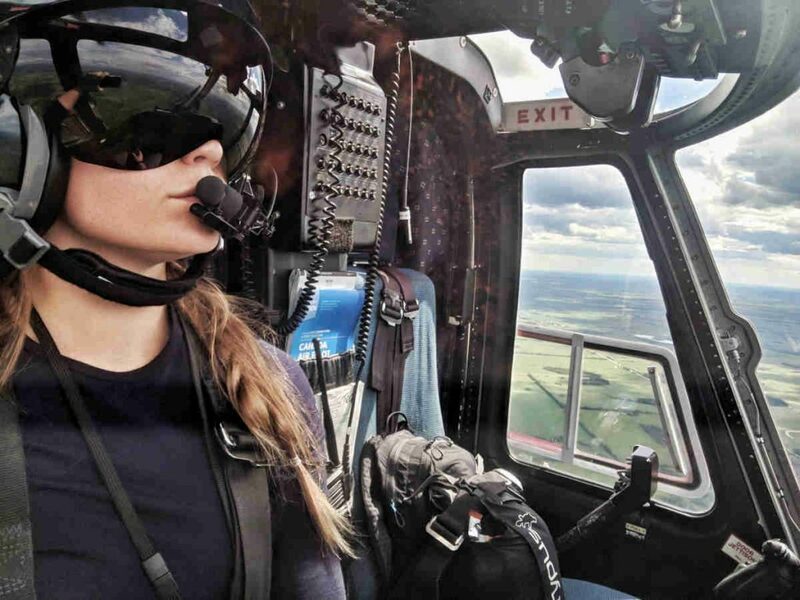 Adele Dobler joined STARS in February 2017, becoming lead schedule service pilot, based in Grand Prairie, Alberta, helping to form one of Canada's highest response rotorcraft teams. 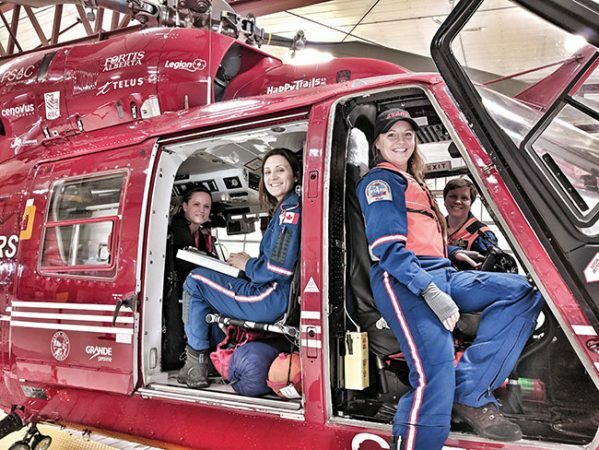 The world of aviation is full of inspiring people like Adele Dobler, helicopter pilot and a captain with STARS Air Ambulance out in Grand Prairie, Alberta. Less than half of the population in Western Canada lives in urban centres with access to critical care. For the other half of the province, access might be measured in hours, which can be the difference between life and death; full recovery or permanent damage. With STARS, people living in rural communities, working in remote areas, travelling on highways or needing transportation major medical centres, can receive the very best in critical care via helicopters staffed and outfitted as mobile ICUs. I don’t know if it’s just me, but learning about careers that take you outside of the 9-to-5 grind is exciting. Dobler became a pilot because she loves everything about aviation, weather patterns, navigation, air law, aircraft systems and, of course, seeing beautiful places from the air. She will soon embark on a new life journey to fly a BK 117 for an air ambulance operation in Kenya. One thing Dobler truly loves about being a helicopter pilot is that you are never done learning. There is always another course, certification, endorsement or utility to learn in her job. It is a career that requires you to think outside of the box and problem solve on a daily basis, and it also brings you to some of the most beautiful places in the world. What does a day in your life at work look like? Dobler: A day in the life of a STARS pilot can be hard to predict. Generally, we start off by checking in and getting a brief from the previous crew about the aircraft or any missions they had the night before. We will then do some checks and a daily inspection to make sure the helicopter is ready to go for the day. Then we are on standby until a tone comes in and we slide down the metaphorical firefighter pole to push the helicopter out of the hangar and be on our way in under 10 minutes. Our destination is anywhere we are needed, whether that is a rural hospital to pick up someone who needs immediate surgery or a highway to pick up someone who has been in a horrific car accident. The Air Medical Crew then does the hard work of stabilizing the patient, so that it will be safe to transport them in the helicopter. We fly them either to the hospital in Grande Prairie or all the way to a facility in Edmonton. Dobler: My favorite thing about my job is being able to see places in the world that no one else ever gets to. I have had the privilege of flying in some amazingly remote and incredibly beautiful areas including Haida Gwaii, Prince Rupert, Willmore Wilderness Area, Jasper National Park, Monkman Provincial Park and others. Dobler: One of the hardest things about my job is staying impartial to the patient. Sometimes, we get a call and the weather is unflyable… but we are responsible to make the safe decision that won’t put our crew in danger in order to save the patient. It can be very difficult to make the call not to dispatch when you know there is someone in need. What stands from your time at STARS? Dobler: One thing I will never forget and also makes me proud to live in Canada is a flight I took at night in the middle of winter. For flights at night, we use night-vision goggles to enhance the safety and visibility when we are out flying in places with no light. I looked out as we were leaving the city and the Northern Lights burst across the horizon and brilliantly started dancing in the distance. Goosebumps covered my skin and I had to focus on my job, because I couldn’t stop looking at them! The goggles pick up each photon of light, so they just filled the entire sky. It was absolutely beautiful. After two years with STARS, Adele Dobler (front right, with other STARS team members) recently accepted a position to fly for an air ambulance operation in Kenya. Dobler: Working for STARS had been a goal of mine for many years since I grew up in Alberta. They are a great company that does an amazing job serving the people of remote and rural towns in this province. It is interesting how dreams change once you attain them, however, and I will be moving on to another role flying the BK 117 in Kenya for an air ambulance company there. I have always wanted to fly internationally, and I will have the opportunity to see some more incredible places in the near future! What pilot advice would you share? Dobler: Breathe – It sounds silly, but there will be times that you feel overworked, overtired, task-saturated and behind the aircraft. Just take one second and remind yourself to breathe, slow down, prioritize and complete one thing at a time. On my approach checks, I secretly add this to my checklist before I land each time. Why would you encourage others to become a helicopter pilot? Dobler: I would encourage anyone to become a helicopter pilot if you truly believe that it is your passion. It is a challenging, rewarding and beautiful career, but there are sacrifices you need to make to achieve your flying goals. There might be times you need to mop the hangar floor at a job in the middle of nowhere. Then you might have to fly in the bush for a few years to gain experience. Then ignore everyone who tells you that girls can’t lift fuel drums… Hopefully, those times will teach you to persist, because you cannot picture yourself doing anything other than flying over beautiful places that no one else will ever see. Writer Kendra Kincade is the founder and executive director of Elevate Aviation, a non-profit organization founded in 2015 in Edmonton, AB, to promote gender balance in aviation by connecting women with a network of support.